Restore both the appearance and health of your smile with state-of-the-art dental implants. Dental implants offer stability and reliability. Are you missing teeth? You’re not alone. According the Centers for Disease Control and Prevention (CDC), 52% of American adults between the ages of 20 and 64 are missing at least one tooth. And almost 20% of adults ages 65 and over are completely edentulous, which means that they are missing all of their teeth. Tooth loss can pose a number of significant challenges in both your health and your self-confidence. When you are missing teeth, it’s more difficult to chew the nutritious foods your body needs to stay healthy. You might experience pain. Your remaining teeth can shift, leading to changes in the way your upper and lower jaw fit together. This can put excess pressure on your remaining teeth, leading to premature wear and further damage. As you probably know, people who are missing teeth often face social consequences as well. It’s unfair, but our society has a tendency to make negative assumptions about hygiene and even intelligence in those who are missing teeth. You may find that both your personal and professional life suffer when you have a missing tooth. 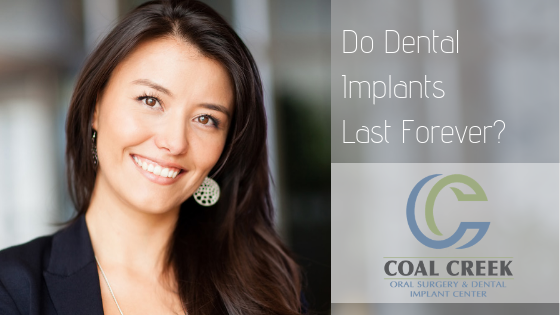 At Coal Creek Oral Surgery and Dental Implant Center in Lafayette, CO, we have a solution to help you restore your smile, your confidence, and your health – dental implants. A dental implant is a prosthetic (artificial) tooth that is held in place by a titanium post that functions as a replacement root. This post is placed surgically into your dental bone. Over time, the post actually integrates with your bone to create a secure and stable foundation for your replacement tooth. This titanium post is what makes dental implants so different from other tooth replacement options. Dentures, for instance, are usually held in place using a combination of dental adhesives and suction, which makes them prone to shifting. Dentures wearers often find that they have to avoid certain foods to prevent damage to their dentures or embarrassing moments. A dental bridge is more stable than a denture, but it does require alteration to existing healthy teeth to properly fit the crowns that hold the unit in place. Dental implants allow us to replace your missing tooth or teeth without having to remove healthy tooth structure. One of the biggest differences between dental implants and other tooth replacement options, however, is one that you might not even realize. A symbiotic relationship exists between the roots of your teeth and your dental bone. In exchange for holding the root in place, the jaw bone receives a steady stream of nutrients and minerals to help maintain its density and health. When the root is gone, this process comes to a halt. The bone no longer maintains itself and becomes diminished and weak. As time passes, other teeth will tilt and shift toward the open space and the bone becomes weaker. Eventually, this will likely lead to further tooth loss, creating a vicious cycle that often results in a collapse of your oral health and a sunken appearance to your face. By replacing the missing tooth root, dental implants can put a stop to this negative process and allow your dental bone to stay healthy. Placing dental implants is a surgical procedure. It just makes sense to trust your implant placement to the skill and advanced training of an oral surgeon like Dr. Hayes. At our oral surgery center, we use up-to-date technology to plan every procedure for the highest chance of success with minimal surprises. Dental implants boast an impressive 95% success rate. 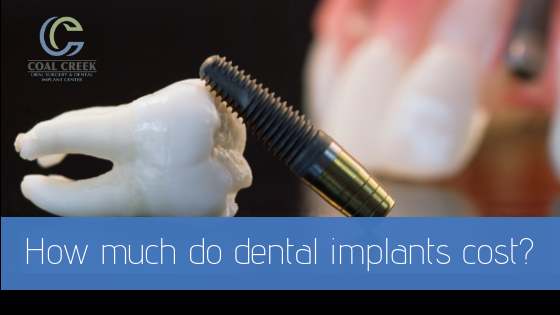 Combine that with how incredibly lifelike your implant will look and feel, and you can see why implants are the gold standard for tooth replacement. 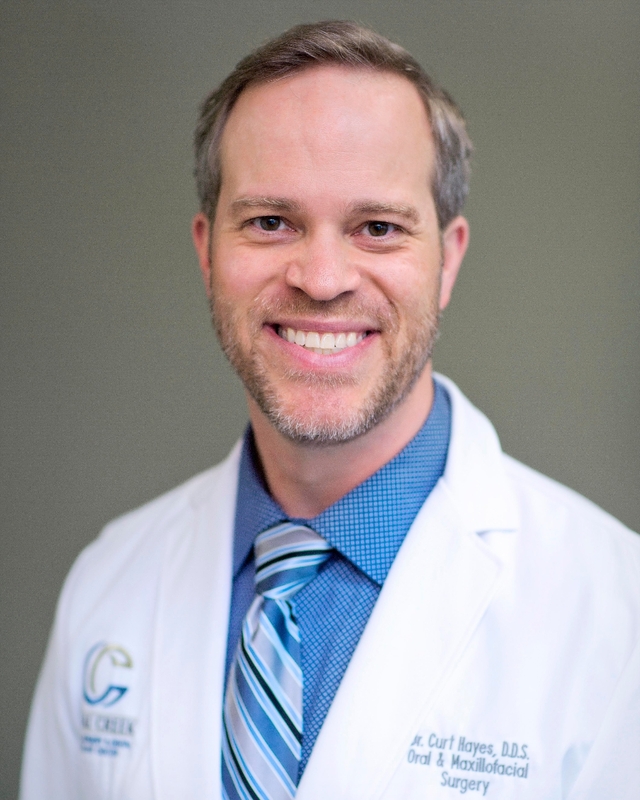 Whether your general dentist has recommended an implant or you are simply interested in learning more about the procedure, we invite you to give us a call so we can schedule a consultation with Dr. Hayes. 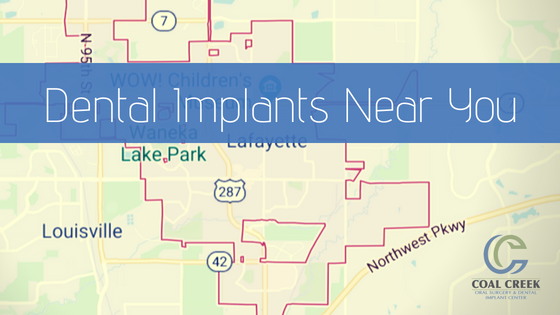 Implant placement at our Lafayette practice.. Missing teeth create multiple problems when it comes to your oral health. A healthy smile depends on having healthy teeth in appropriate alignment. When you lose a tooth, it knocks that alignment out balance. This often leads to problems like joint pain, clenching and grinding, and excessive wear. Missing teeth also lead to neighboring teeth shifting and tilting into the open space, which also causes problems with your alignment. You’re likely to avoid eating fresh healthy foods, which damages your overall health. Plus, you are likely to face social stigma, which can make social and professional engagements awkward and uncomfortable, damaging your self-esteem and self-confidence. One of the biggest problems with missing teeth, though, is that they set off a chain reaction of damage in your mouth. When you lose a tooth, your body stops sending the necessary nutrients to the bone beneath. Without these nutrients, the bone starts to fail, becoming weaker and diminished. Neighboring teeth, which have probably already started shifting, are likely to become loose themselves and may eventually be lost, expanding the problem. While tooth replacements can solve the esthetic challenges and alignment issues, only dental implants solve the problem of bone loss – just one of the reasons why they have become the gold standard when it comes to tooth replacement.